Not for the first time, I find myself starting to write about Elizabeth Maconchy by lamenting the shamefully poor state of her discography. With the exception of a handful of chamber and vocal works I am not aware that any of her orchestral or larger-scale pieces are in the current catalogue. Unfortunately recordings have never been plentiful but I still live in hope that someone will see fit to re-release the recordings of her Symphony for Double String Orchestra and Serenata Concertante for violin and strings (the excellent soloist was Manoug Parikian). These were available on prime Lyrita vinyl some years ago. The same can be said for another Lyrita effort (yet another plea for the unlocking of their archive!) and a record I remember with affection that included Maconchy�s Op. 1, the overture Proud Thames. All the more reason then for applauding Forum (better known as Regis) for restoring this fine cycle of String Quartets to the catalogue. These recordings were originally deleted some years ago as a result of the sad demise of Unicorn-Kanchana. Even better, the quartets are available here at bargain price and complete for the first time rather than the three individual volumes that existed previously. Better value for money you will simply never find. The point that strikes me time and time again when listening to the early Maconchy quartets is the astonishing way in which she found her own voice so early and achieved a notable degree of stylistic consistency as a result. Even in the First Quartet, completed in 1933 when she was twenty-six the sound world is quintessential Maconchy. It is worth noting that by this time her orchestral suite "The Land" had already been performed at the Proms under Henry Wood to considerable acclaim. In the first movement listen to the soaring violin melody over the shifting harmonies in the lower strings at around 1:00 for a fine example. These days this would not be considered such a feat. We expect, unfairly I would say, our composers to be fully formed in their compositional personalities very early in their careers. But it should not be forgotten that although Maconchy took up piano lessons and started composing early in life she was essentially a country girl with no musical background in her family. Indeed she did not hear a symphony orchestra or string quartet "in the flesh" until she was around seventeen, by which time she was already a student at the Royal College Of Music, her mother having brought her over to study from Dublin where they had been living at the time. The composer maintained that the only area in which the Quartet No. 1 was not fully representative of her mature style was in its more restricted use of counterpoint. Not that it is devoid of counterpoint of course � far from it. However it is true that the "counterpoint of rhythms and harmony" that is such an integral part of the Maconchy quartet cycle, indeed of her entire output, became more defined over forthcoming works. Not surprisingly the quartets are the absolute backbone of the composer�s output. Maconchy said that it was in the quartets that she had "worked out" her musical path. A glance through the chronology of the works shows that the greatest gap, between the seventh and eighth quartets, is twelve years. In short she produced a string quartet every four years over a fifty-two year period from the commencement of the cycle. Over a time-span as long as fifty-two years it is inevitable that the music should change and develop and indeed it does. Maconchy�s technique acquires, albeit almost imperceptibly, greater sophistication and the language gradually becomes tougher, the harmony more astringent and dissonant whilst never abandoning its basic reliance on melodic and harmonic motif. Yet there are also many constants that stand like fingerprints of the composer�s hand. The "impassioned argument" is ever present, the dialogue and conversations between the instruments that were so important to the composer are always in evidence. Throughout the cycle there are little snatches of melody, harmonic patterns, intervallic motifs and telling rhythmic devices that catch the attention and draw the mind back to other examples in the cycle. It makes for compelling listening. Structurally also one soon begins to become familiar with how Maconchy liked to write. So much of the music stems from one, perhaps almost innocuous, cell or motif that can often comprise only a handful of notes but becomes meaningful as the composer grows the material for the entire work from that one pivotal figure. She was a master of structural concision in this way and all of the quartets are admirably organised yet constantly fascinating as a result. The presiding influence on Maconchy throughout her life was Bartók and it is in the rhythms of her music that I feel him to be closest. Yet although the ghost is undeniably almost always there, it is never overbearing. Indeed, it is Maconchy�s own integrity as a human being and utterly tireless personality that shine through the music and ultimately mark this cycle out as one of the finest. We are blessed with several fine cycles of twentieth century British quartets and I would draw attention to those of Robert Simpson and Daniel Jones as being particularly gratifying. 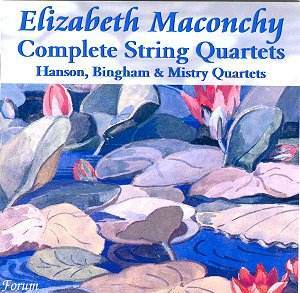 However, the journey through the quartets of Elizabeth Maconchy will always prove to be one of the most rewarding that the open-minded listener can take. In conclusion, it is perhaps wrong to highlight individual ensembles in the context of an admirable project such as this. That said, I will comment only because it is almost impossible to listen to this set without forming certain judgements about the inevitable contrasts between the three quartets involved. In point of fact all acquit themselves with credit, but I found myself particularly drawn to the playing of the Bingham Quartet. During the last years of her life they enjoyed a close working relationship with the composer and it shows in the sheer commitment, fire and rhythmic attack in their playing. It is quite clear that the Binghams relish this music and their strong performances of the Fifth and Sixth Quartets in particular will give much enjoyment. A fine reissue then and one that no collector with an interest in British music or the string quartet medium in general should be without. If you missed out on the three separate volumes when they were originally issued then do not hesitate to take advantage of this first rate bargain.